Administration forges School Safety Partnership - KUAM.com-KUAM News: On Air. Online. On Demand. In line with securing schools, Gov. Lou Leon Guerrero and Lt. Gov. Josh Tenor made a visit to Simon Sanchez High School. The school has recently made headlines as a target for break-ins. This week, the Guam Police Department arrested at least three suspects in connection with the crime. At the home of the Sharks, the administration announced they're fighting back, with the creation of a School Safety Partnership. Taking her first tour of Simon Sanchez High since she's been in office. school safety is on the minds of the administration. "It's not just the recent break-ins but a list of safety concerns, such as heavy weather, substance abuse, school violence, and potential active shooter situations," Leon Guerrero said. That's why the governor's office announced the creation of a School Safety Partnership promising to tackle these issues. The partnership will focus on addressing three areas of concern, including securing facilities, like the much-anticipated rebuilding of the Home of the Sharks. 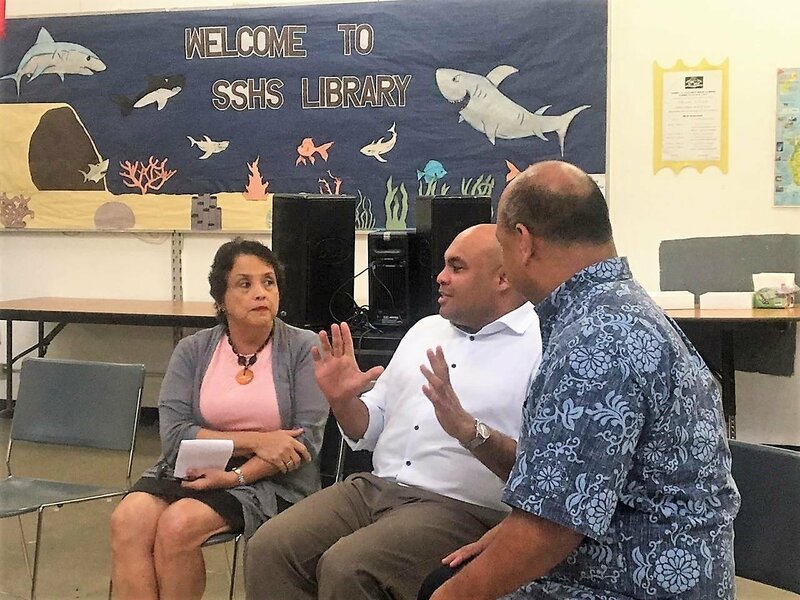 "Of course facility is a major, major, major concern, and the Superintendent and I were talking and he has assured me that he is going to be aggressively pursuing the process we have to do to rebuild Simon Sanchez," the governor said. "But Safety is not just about facilities, but safety is also about your whole health your whole life." The Governor's office and GDOE will work with members of the Guam Police, Guam Behavioral Health and Wellness Center, and Guam Homeland Security. Tenorio will be spearheading the effort alongside Superintendent Jon Fernandez. "One huge area is in behavioral health, mental health and wellness, 101 We know that suicide is very very high," Tenorio said. "Our whole mission is to try to reduce the number of kids in the juvenile justice system and to do things on the school side that are going to be more effective." "And the final piece is law enforcement responsiveness and presence in our school system, and of course there's a public discussion on what level that needs to be in," Tenorio said. "But we want you to know that when you come here you have expectation to be in a safe learning environment." During the press conference, Tenorio also says they have big ideas for student transportation, so students do not have to wake up at 4 a.m. to catch a bus. The Governor is setting a deadline, that recommendations to tighten school security be submitted by the end of June.